Type your slogan and starting number in this box. Silicone wristbands with sequential numbering is gaining in popularity with many people.The price is all inclusive for wristbands with your personal message, numbering and shipping. Color fill and other special features are available for an extra charge and can be added as you place your order. Please enter your preferred numbering sequence in the information box. We can do Alpha Numeric numbers as well. 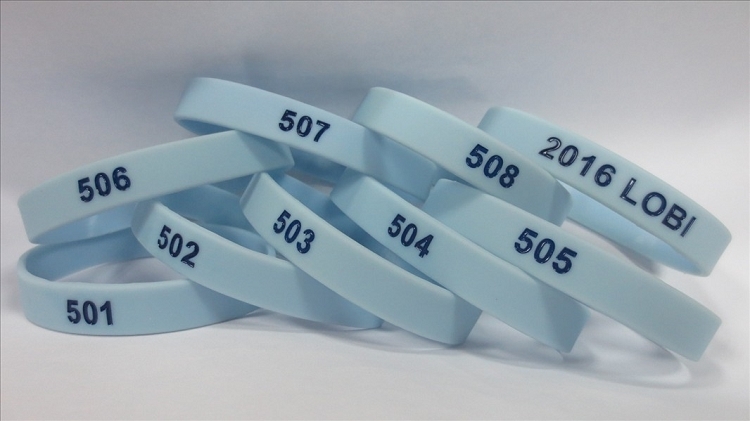 The minimum order for the numbered silicone wristbands is 250. We offer all the colors from the PMS color chart, both for the wristband color as well as the color fill or printed image if desired. We can't put the pms color chart on our website due to copyright laws, but if you enter a color, together, we can figure out the best one to use. The proof we send to you the next day will provide the needed information and allow you to make any adjustments you feel necessary. Thank you. We appreciate the opportunity to be of service. If you have questions, please feel free to call 353 841 4057 or email discountwristbands@comcast.net.